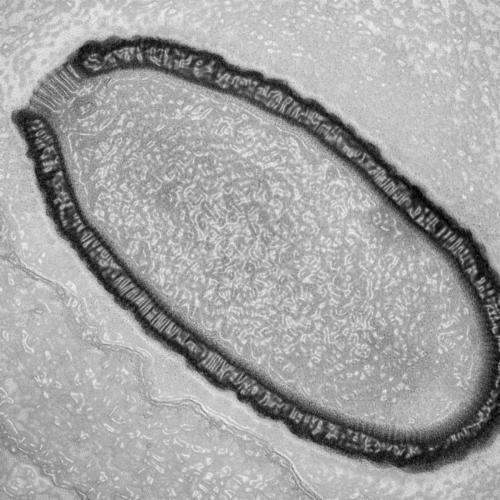 French scientists said Monday they had revived a giant but harmless virus that had been locked in the Siberian permafrost for more than 30,000 years. Wakening the long-dormant virus serves as a warning that unknown pathogens entombed in frozen soil may be roused by global warming, they said. Dubbed Pithovirus sibericum, the virus was found in a 30-metre (98-foot) -deep sample of permanently frozen soil taken from coastal tundra in Chukotka, near the East Siberia Sea, where the average annual temperature is minus 13.4 degrees Celsius (7.8 degrees Fahrenheit). The team thawed the virus and watched it replicate in a culture in a petri dish, where it infected a simple single-cell organism called an amoeba. Radiocarbon dating of the soil sample found that vegetation grew there more than 30,000 years ago, a time when mammoths and Neanderthals walked the Earth, according to a paper published in the US journal Proceedings of the National Academy of Sciences (PNAS).